A funny, faithful introduction to Jesus, comparing him to other popular versions of "Jesus". Perfect for giving away. Good teacher… or intolerant judge… or children's story… Who is Jesus? This is a book about Original Jesus—the one who actually lived in human history. The one who often gets hidden behind all the other versions of Jesus we're offered. The Jesus who is controversial, compassionate, sometimes uncomfortable, often unpredictable… and completely real. This short, lively book explains how Original Jesus really matters to people today—how his life can transform peoples hopes and futures. Short, funny, friendly and easy-to-read, Original Jesus looks at seven episodes in Jesus' life from the Gospel of Luke, and explains the central gospel message. Perfect for giving away to unbelieving family and friends, whatever their view of Jesus, and for handing out at church outreach events. Yes, but... isn't it all made up? Yes, but... can we really believe in miracles? Yes, but... surely Jesus didn't really rise? 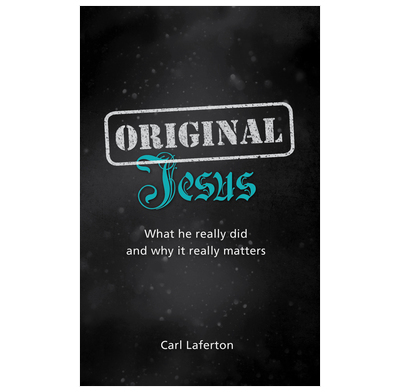 Laferton simply and attractively walks through Luke's Gospel and in a simple, interesting and relevant way speaks into our culture, which increasingly thinks it's OK for the individual to invent their own view of Jesus. This is a book worth anyone’s time. I loved reading it, and I'd love my friends to read it. Christianity is about Jesus Christ, and this wonderful book shows why he is worth thinking about and getting to know. The genius of this book is that it isn’t about who we might think Jesus is —it’s about who he really is. Brilliant. Quick, easy, and to the point, Original Jesus unmasks the frauds and presents the real thing. The real Jesus is so much more compelling than the various Jesus characters of our imaginations. This superb book will introduce you to Original Jesus—do yourself a favor, open it up, and get to know him. This is a gem of a book. Carl takes us back through the gospels to remind us of who Jesus really is: a person, not a sketch, who transforms those he meets. Deep theology, simply put. Our culture loves to reinvent Jesus in its own image. This tremendous book gives us a strong and thrilling dose of reality. Like a friend, this book helps sort through the question of who Jesus is. It points to the original Jesus in a lively and conversational way, so that we interact with voices all around but hear, finally, the words of Jesus himself. This book is like the best kind of friend, bringing us to meet Jesus. Great - straight to the point (like this review!). Each selected episode brings a challenge to any preconceptions and interacts with the type of response people might make. He begins with Jesus’ power over nature : evidence of his deity, then the healing of the Gadarene demoniac :to show his power over evil, next the raising of Jairus’ daughter :to show his power over death. In the parable of the tenants he shows God’s intolerance of rebellion. With the Pharisee and the tax collector he demonstrates the need for honesty about our unworthiness. When looking at the cross he shows the wonder of God’s promise to welcome such into his kingdom and the price he paid as a substitute to provide forgiveness - and with the resurrection validating his promise. Lastly through the way Jesus had time for children he shows how we need to be child-like in dependence upon Jesus. There are appropriate follow-up suggestions for reading a gospel or joining Christianity Explored among others. The author also has brief sections responding to common objections such as on the trustworthiness of the Bible, miracles and the resurrection. In a very disarming way, this book looks at common understandings of who Jesus was and moves on to discuss who Jesus really is in relation to each misunderstanding. While I've been a christian for decades, I think the style of this book would be very helpful for those who aren't christians and for those who have recently become christians. I have one incredibly small criticism - I don't like the gothic type face on the front page and at the beginning of each chapter. Other than that, can't fault it. Excellent booklet for sharing Jesus. The author gives various common views of Jesus, then presents the real Jesus. It really 'does what it says on the tin.' Easy to recommend.